Impulse moves drive trends. As long as each trend leg extends in a momentum move approximately consistent with previous moves, the probabilities favor buying the next pullback for another trend high, or, in the case of downtrend, shorting the pullbacks for another run at the lows. What you do not want to see in a trend is the emergence of sharp counter trend momentum moves on one of the pullbacks. It is important to understand the subtle clues the market gives us, sometimes the most important ones are very obvious. There is no point trying to trade with the uptrend after an emergence of counter trend momentum, it is safe to assume the trend is broken until further notice. Remember, the normal pattern in an established trend is that each setup leg is a momentum move, and the subsequent extensions also function as momentum moves setting up the next trend leg. Economics 101 tells us that increased demand in a market will lift prices as the market tries to find a new market-clearing price; this description of trend movement is one of the mechanisms through which that adjustment happens. Eventually, higher prices will bring enough sellers into the market that a new, perhaps temporary, equilibrium is achieved. Astute technical traders can usually see clues to this process in the market tape. 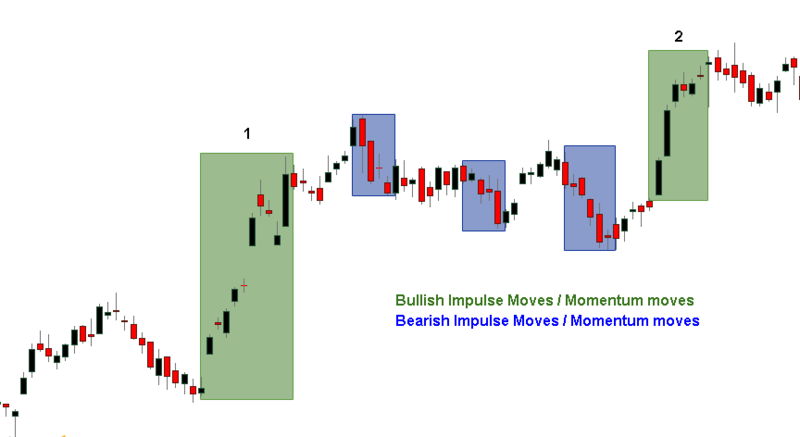 The most important patterns are: new momentum highs or lows, subsequent trend legs making similar new impulse moves, and the absence of strong countertrend momentum on pullbacks. Buy pullbacks following an upward impulse move, or short bounces after strong selling impulse moves. That, in a nutshell, is a very effective plan for trading trends. Not so fast—there is a potential complication, and it is one of the most significant problems in technical analysis. It is true that there should be follow-through in the direction of previous impulse moves; however, extremely strong impulse moves are more indicative of climax or exhaustion. This is one of the common ways that trends end, so it is important to fully understand these patterns. These types of formations a type of short-term mania sets in as emotional buyers chase the market higher and higher. At some point, the last buyer who wants to buy has bought, and the market becomes extremely vulnerable to a sell-off. The slightest pause or speed bump will send a market like this crashing back into the vacuum on the other side, as there is no more natural buying pressure underneath the market. In addition, there may even be traders who bought into the last trend leg, and they are now the last weak-hand longs. A climax, by itself, is probably not enough information to justify assuming a counter trend (though it does have the advantage of defining a clear risk point), but it should at least put trend traders on caution. Do not enter pullbacks following potential climaxes.